New and Exclusive to Patinkas - made in-house by their healers and jewellery designers. An exceptionally beautiful charm bracelet in Blue Lace Agate with a very contemporary feel. 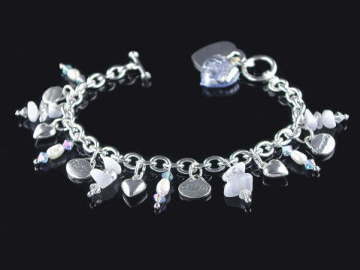 We have hand-wired a combination of genuine gemstones, AAA grade freshwater pearls, sterling silver puffed heart charms and AB coated (fire sheen) blue Swarovski beads on to a heavyweight, 925 sterling silver, heart and toggle, Tiffany-style charm bracelet, which is finished with a Murano glass, blue, puffed heart charm. This bracelet features 4 sterling silver 'phrase' charms: Peace, Tranquility, Dream and Happiness. The bracelet comes with matching earrings (as illustrated) and is presented in a beautiful, faux, red, leather box, lined with white velvet. Each bracelet also comes with a Certificate of Craftsmanship and Authenticity, signed by the healer who made it.